I originally bought this from a plus size bridal shop, and thanks to my recent weight loss it's now way too big for me. I was a 42DDD/F and it fit perfectly at the time. I imagine that if you're a 42DDD/F, 44DD, or 46C/D/DD that this would fit you well. I only really wore it once when trying on my dress, so it's brand spanking new. Smoke free home. 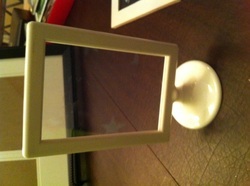 I got this from another local bride on Craigslist, and again because of my weight loss became too big for me. I only wore it twice to try on with my dress. David's Bridal sells this for $89. This was a DIY project. I even installed the lock on it, it worked great for my wedding! I had 95 guests, cards only filled about half the box so I imagine it would work for a 150-200 guest wedding. 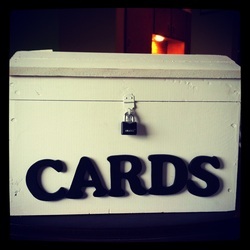 I also cut a large slot in the top, so large cards will definitely fit. Just because of size and weight, I will NOT ship this- only MN local pickup. 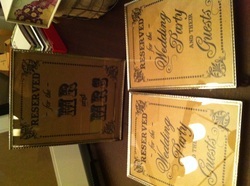 I used these on our sweetheart table and 2 other tables that our wedding party sat at. Got a lot of compliments on these!